At Decaleco, customer satisfaction is the number one priority. We believe that when customers know how wall decals are made, a better trust and loyalty can be established. We who've been working behind the scenes have been so busy making awesome wall decals for you. We know you love to jazz up almost every nook and cranny of your walls. You are not alone. We love it too! It's like an uncontrollable desire to stick wall decals and an urge to construct more walls just so wall decals can be applied. You may think we are obsessed, but hey, everyone's got an obsession for something right? So to keep you from making your walls look like a BIG collage, we have devised a plan where you can divert your decals obsession – sticking Decaleco wall decals to mobile phones, laptops, tablets, cars and even on the toilet seat to give your walls time to breathe! We DON'T PRINT. We Cut All of Our Wall Decals. Here's Why? We make wall decals using cutting technology. We make them by hand. Remember your elementary years when you had paper cut outs? Yep, that is how we make our wall decals. We stick by this cutting technology because we love how our wall decals give the painted-like effect to the walls and there is no clear contour or white contour around the designs like those regular stickers. For wall stickers that are manufactured via printing technology, you can easily spot the difference in quality – they are usually thicker, colorful, use solvent inks and have a white/clear contour around the design, and the edges do not stick very long on the walls (low quality adhesive may also damage your walls). Of course, their manufacturing cost is low but that's pretty much the only advantage it has over our wall decals. Ladies and gentlemen… Let us show you how to make wall decals. You will see that besides the accuracy of cutting details achieved by a cutting machine, pretty much every piece of our wall decals is made by hand and with absolute care 🙂 We want you to receive top quality wall decals from us. We cut them directly from high-quality vinyl color rolls, just like cutting out drawings from an art paper. We can cut any size of decals, as small as to fit your cell phone to as big as to decorate a large wall of a nursery school. See the versatility of wall decals? We then weed off the excess vinyl material. We do this very carefully to make sure we don't tear off the tiny parts of the decals. Notice in the picture how the design of the decal starts to appear? Now, we are left with some excess parts within the letters. We peel off the excess parts carefully by hand and with the use of tweezers, making sure the designs remain intact. And of course, we check and check and check to make sure we have peeled off all the excess material. Wait… we are not done yet! Now, we cover the wall quote decals with transfer paper for easy installation. Because the vinyl material we used is very thin (only 3 mil), it's very difficult to just peel and stick on the wall without messing things up. The transfer paper is here to help you out for the installation. Here's the time to gear up your creativity. You can cut out some parts of the wall decals quote and position them to suit your liking. Ta-dah! This is how it will look like when applied to walls. It's like an original paint from a skilled artist, right? Drab walls to FAB walls in a flash! 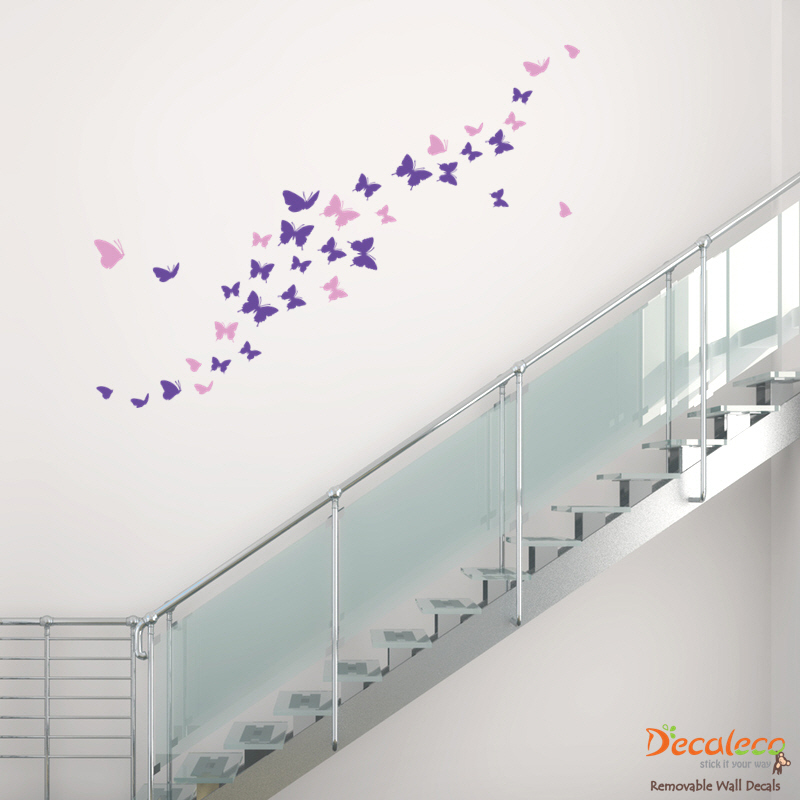 We love movement and we have designed these butterfly wall decals to recreate motion in homes. We created these wall decals with utmost intricacy to imitate movement inside your home. It is like watching butterflies flying high in the sky, except they are soaring across walls. The choice of 2 colors adds up a 3D effect and transforms your home to a butterfly sanctuary. Who doesn't love reading adages? We came up with beautiful vinyl wall art quotes about family, faith, self-confidence, love and humor. We know those daily dose of inspiration and pick-me-uppers plastered across your walls will inject happiness to your life every single day. Check out this Stronger, Braver, Smarter wall decal we have made. This is one quote we know that will be forever kept close to the heart. We love things with dual purpose and we made sure we merged that with the wall decals we are making. 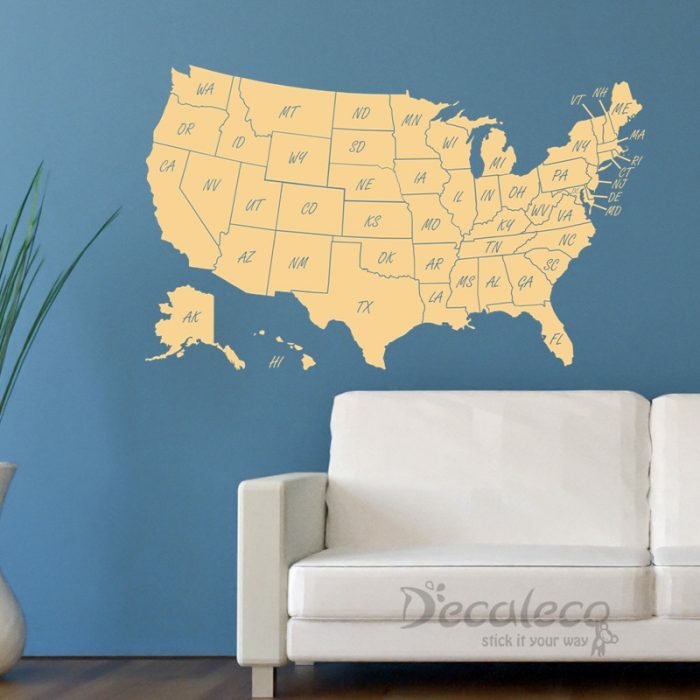 Check out this behind the scenes picture of USA Map with State Labels wall decal. It's like looking into a real map, right? Notice how meticulous the states are divided and named. What a stunning wall decor and a great tool for teaching children geography. Join the bandwagon and witness how amazing wall decals are. For more photos on how to make wall decals, check out this behind the scenes photoshoot. We have a wall decal for every personality, mood and preference. Cheers!